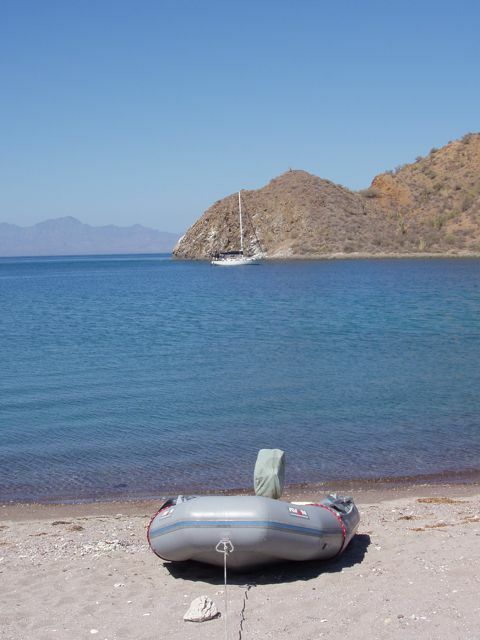 Puerto Ballandra is on the northwest side of Isla Carmen, an enormous island east of Loreto. 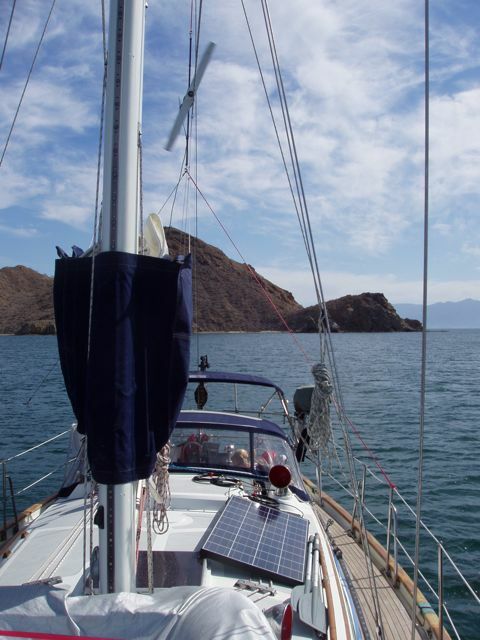 At over 20 miles long, it has several bays that are open for anchoring. Several years ago, Salinas del Pacifico, the company that owned the salt mines (although they had ceased salt production, and the mines had changed hands several times) decided to try and resurrect the indigenous Baja Mountain Sheep, one of the "Big Three" mountain sheep in North America, along with Alaska's own Dall Sheep and the Big Horn of the Plains states. With Isla Carmen as their nursery, they cull several young adults each year to replace losses and build herds on the peninsula. We have heard that they've been successful. It's an impressive tribute to a company using their own resources for the public good. Darwin would have loved these islands since each has reptiles and plants that live ONLY on one island: genetic drift in action. For example, one island has a rattle-less rattlesnake. Yikes! 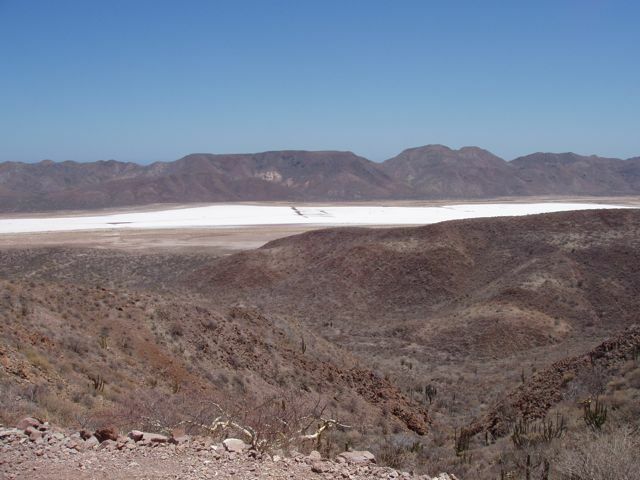 On the Northeast side of Isla Carmen, there is an extensive and self-replenishing salt flat. Workers were brought in by boat and walked overland to work in the industry that has since "dried up". Various other ventures have tried to utilize the infrastructure of the old salt works but none has succeeded. Conni planned a hike from the boat to the old salt works, a round trip of about 14 miles. We reached a high point with a good view and turned around. She related more on the hike in our blog. How we make energy without petroleum: solar and wind. We have two panels of the size in the photo, and we launch the wind generator when conditions are promising. We can maintain our batteries indefinitely with this system, assuming we have sun and some wind. Our two boats: Wings in the background, and Little Wing in front. We've taken to covering the engine on Little Wing to protect it from the intense sun. Sure sign of human habitation. 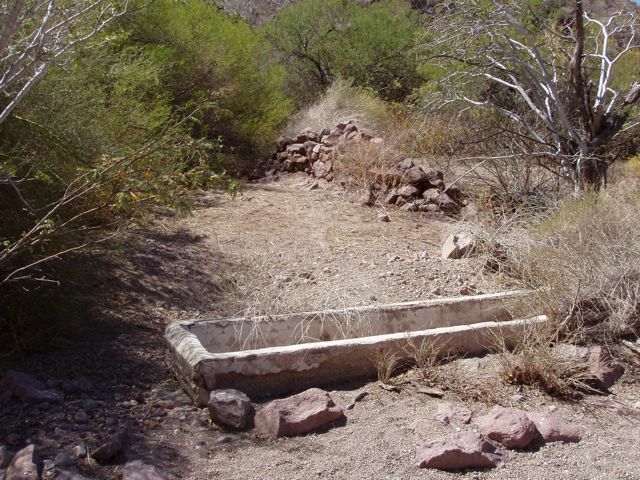 This concrete water trough and rock wall were probably part of a rancho many years ago, but we could learn nothing of it. 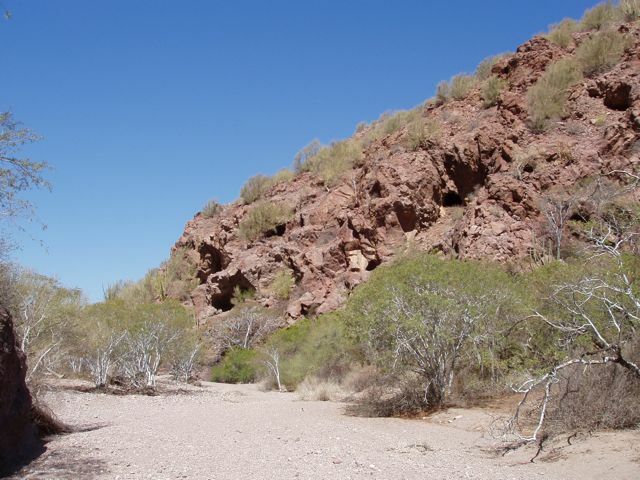 Arroyo. We walked through this for many miles and it shows the unmistakable sign of heavy water flow: trees swept into banks, big boulders moved around. In the rainy months, the island must receive torrents of rain. 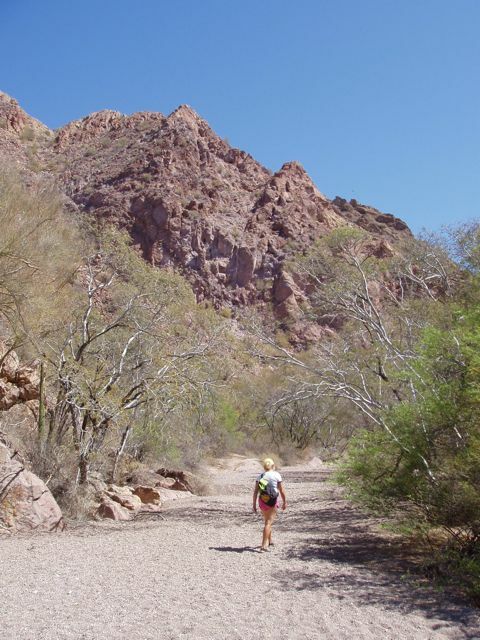 Lovely Conni walks in the arroyo. Years of foot traffic had provided highway markers so it was impossible to get lost. Small cairns and other markers were well and frequently placed. 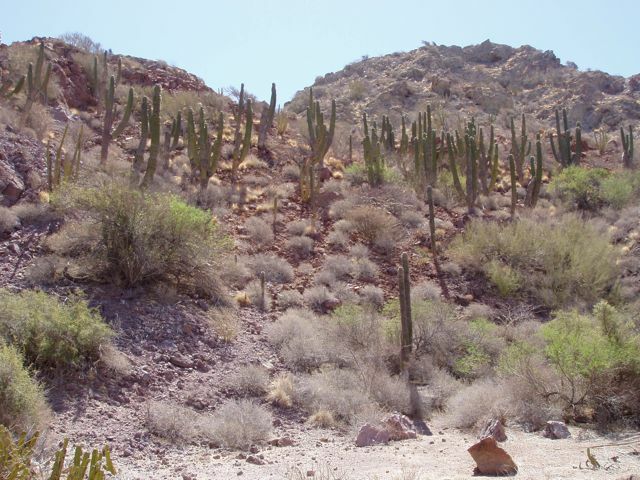 A hillside of Saguaro cactus. Fascinating. As Ian Malcolm (Jurassic Park) said, "Life will find a way", and indeed it does. 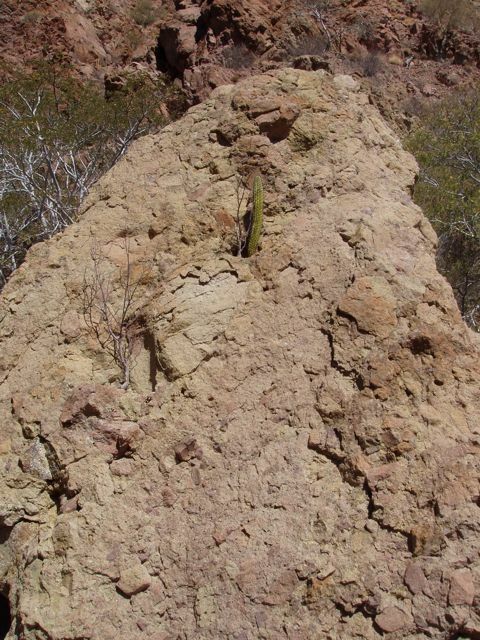 The rock is "breccia" or volcanic ash loaded with other rock types, and in any tiny fissure, a plant has taken up residence. Lovely Conni surrounded by classic desert plants. 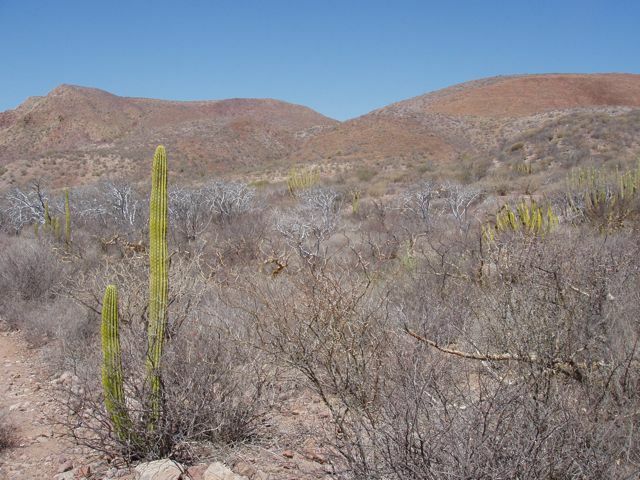 Saguaro cactus at left, and Palos Verde (Green Sticks) at right. The Palos Verde has green "skin" that photosynthesize, so it's all green. 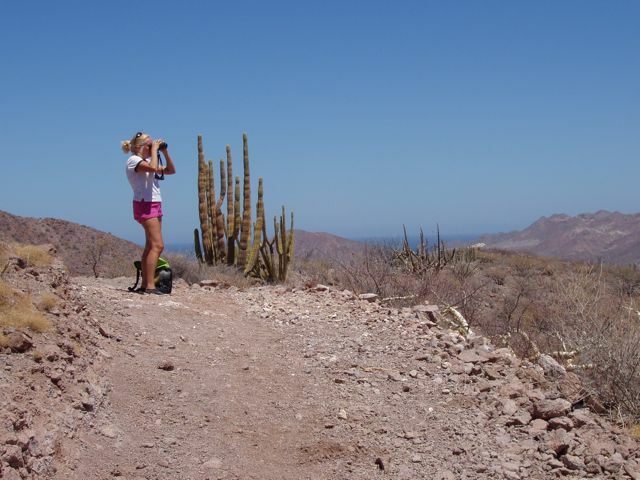 This is for you, Mr. Cook: proof of Baja Sheep. 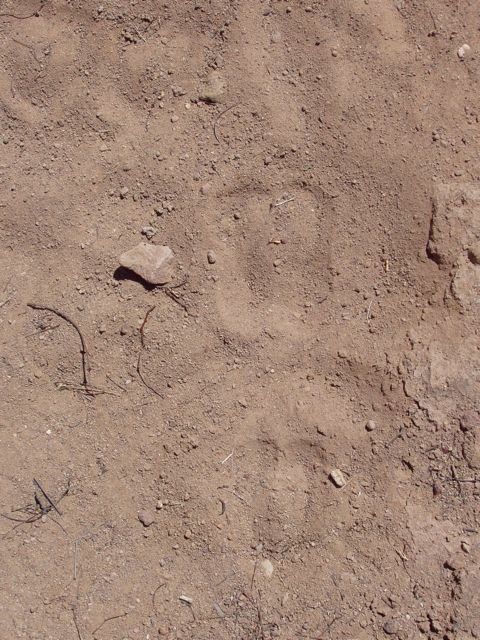 In places, our path was covered with these tracks. 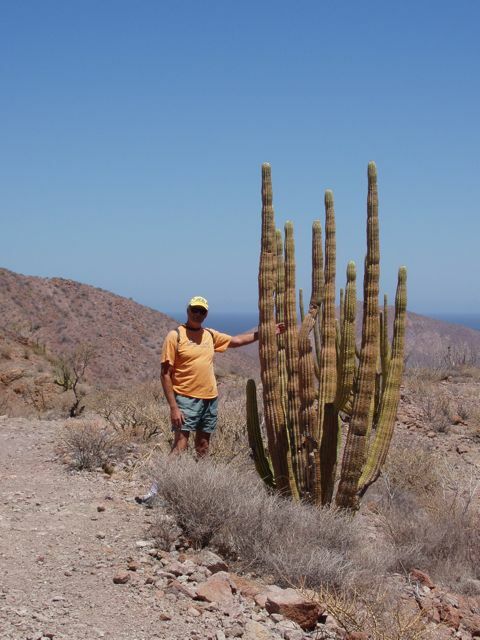 Isla Carmen certainly doesn't seem that it's ever received any rain, but it does. It's very hot and dry. The salt works village next to the very shallow bay. We found some shade behind a large bush, ate lunch and drank whatever liquid we had, and returned to the boat. The salt flats, gleaming white in the sun. 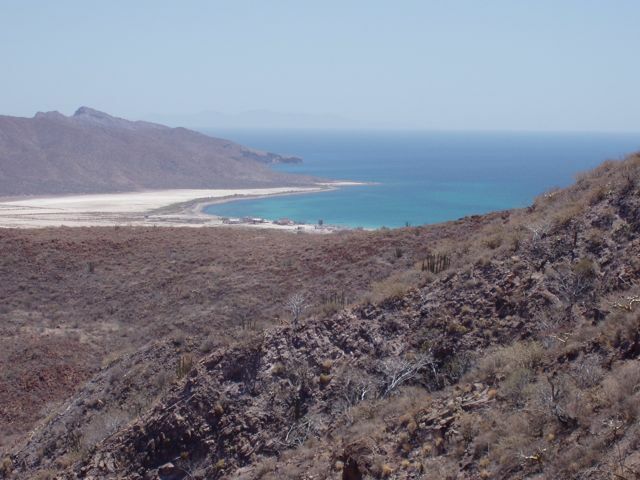 There's enough welling of the salty Sea of Cortez water that the flats are self-replenishing. Two of the old collection areas lie in photo center. Hot, hot, Conni glasses the salt flats. Bill shows that he's not friendless by placing a hand on the shoulder on a local. Bill got WAY too hot after motoring up this mountain, and needed some shade.